A is for apple! 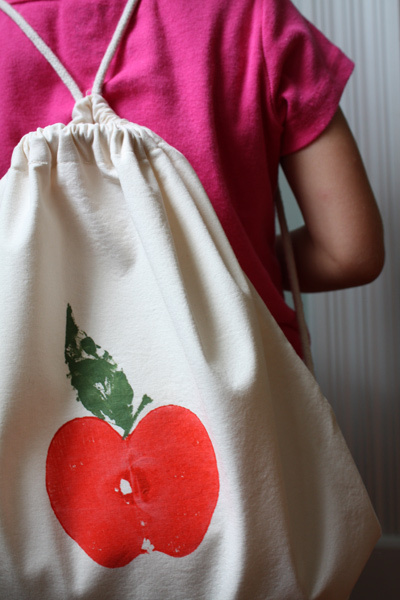 Get ready for school with this apple print drawstring backpack. 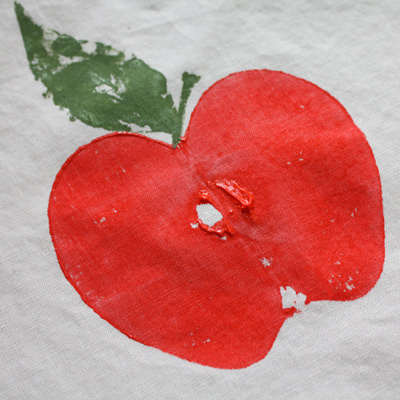 Let the kids make their own fabric pattern with an apple and some fabric paint. Then sew it up into a backpack. This one is designed to be small for younger kids, but you could easily make the pattern pieces larger. I sewed this backpack myself, but this is a great beginner project for an older child. The instructions for the apple printing are below. Click here for the drawstring backpack sewing pattern. We sliced the apple in half and blotted it with a towel to remove the excess moisture. Then we painted the fabric paint onto the apple with a large brush (or you could dip your apple into a tray of paint), then the kids pressed it onto the fabric and carefully pulled it away. Since our apple didn’t have a leaf attached, we used one from the yard and repeated the stamping process with the green fabric paint. Then we painted in the stem with a paintbrush. My kids had a lot of fun with this, so we printed about a yard of fabric. I ended up making one backpack with a single apple print and another backpack with a repeated pattern of apples. If you want to use only one print, it’s a good idea to cut your fabric in advance. 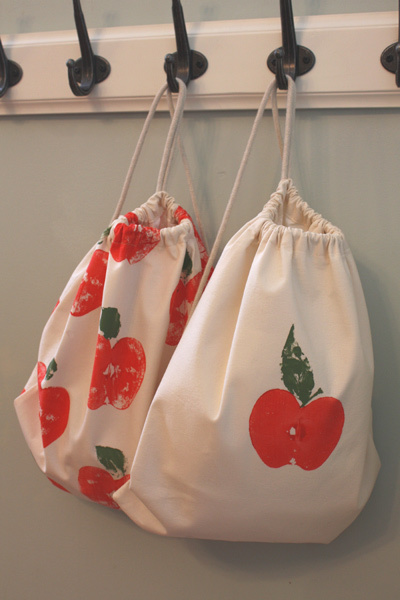 If you’re not ready to try your hand at sewing, apple prints would make great wrapping paper or cards for teachers. I also think it would be nice to print kitchen towels with various fruits and vegetables. We might try that next. I so needed to be reminded about apple prints. I love the idea of a backpack but maybe I’ll make some reusable grocery totes with this too. apples, cauliflower, mushrooms….my mom *loved* having us make veggie prints. I think we used the mushroom-printed blank cards for years – they looked pretty classy, too. Love it. Can’t wait to try it with the girls. Thanks for the backpack pattern too! I love printmaking, and I love apple motifs – well done! Ohhhh…I love these. 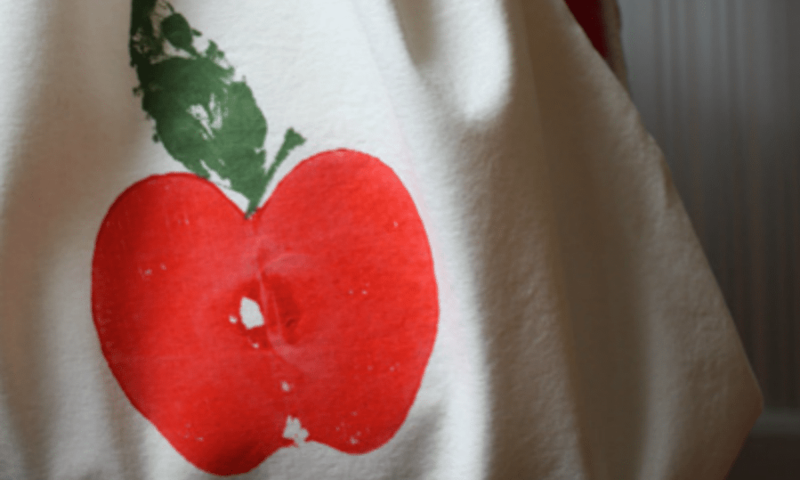 We had an apple themed day that created itself the other day and had considered doing some apple printing, but I love the simplicity of the backpacks, and you could size them well for smaller kids too. Where did you get the drawstring backpack? Can you send a link? I love this idea!! You made it easy! 🙂 What’s the bag material?